How much does it cost to travel to Drakensberg? How much money will you need in Drakensberg? R1,350 ($96) is the average daily price for traveling in Drakensberg. The average price of food for one day is R246 ($17). The average price of a hotel for a couple is R1,123 ($80). Additional pricing is in the table below. These average travel prices have been collected from other travelers to help you plan your own travel budget. Drakensberg, whose name derives from the Dutch and means "mountains of the dragons," is a mountainous region which encompasses a vast amount of South Africa's interior, extending into neighboring countries as well. It hugs the eastern border of Lesotho, attracting visitors for hiking, backpacking, and admiring the natural wonders of the landscape. 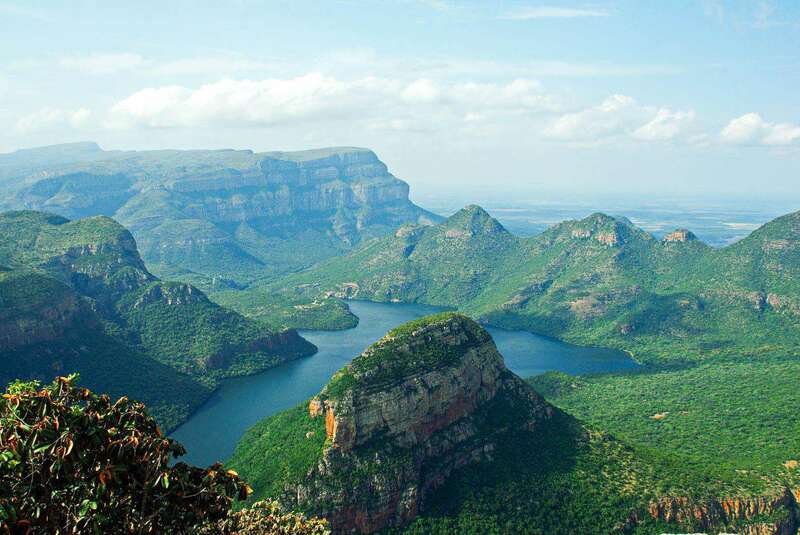 Ukhahlamba Drakensberg Park is an UNESCO World Heritage Site centered on the Drakensberg mountain range. One of the highest peaks in the park is Champagne Castle, towering at a height of 3,377 meters above sea level. While the higher peaks consist mostly of basalt rock, the lower elevations are mostly sandstone and even have caves with rock paintings left by the San people. Some 20,000 individual rock paintings have been recorded at 500 different sites between the Drakensberg Royal Natal National Park at the northern end and Bushman's Nek in the south. The flora and fauna of the park are additional attractions to the mountainous region. Wildlife like bushbuck, oribi, mountain reedbuck, tiny duiker, vultures, baboon, and the largest of South Africa's antelope species, the eland, as well as many others can be found here. The spring gives life to carpets of wildflowers and other plant species, while the autumn gives color to the blossoms of the lower reaches of the Drakensberg. While Royal Natal National Park is a separate entity, it also forms a part of the Drakensberg range. Highlights of this park include the Amphitheatre (visible from most of the park), the Cascades (set of waterfalls), and the Tugela Falls (the world's second highest waterfall with a total drop of 947 meters in 5 leaps). Towns and cities in the Drakensberg area include Matatiele and Barkly East in the Eastern Cape Province, plus Ladysmith, Newcastle, Ulundi (the former Zulu capital), Dundee, and Ixopo in the province of KwaZulu-Natal. The mountains also encompass much of Lesotho, whose capital is Maseru. Matatiele and Barkly East are on the southern end of the rangeMatatiele being a mid-sized town rooted in dairy farming, and Barkly East a small community in an area characterized by rugged mountains and green valleys. The towns of the KwaZulu-Natal province also each have their trades from textiles, farming, and coal to a bigger city like Newcastle which has all the comforts of a metropolis. Maseru in Lesotho is another bigger city, often a home base for travels deeper into the country. The nearest major cities to the Drakensberg area are Johannesburg to the north and Durban to the south, making them the hubs from which visitors begin due to convenience of transportation. In the Drakensberg, most visitors look to the outdoors for daily activities and entertainment. With striking mountain scenery, wildlife, and thriving vegetation, the area is popular with those hoping to go hiking, backpacking, camping, fishing, and much moreanything that fully immerses oneself into the mountain environment. Cuisine of South Africa is characterized by a combination of indigenous, Dutch, French, and Indian influences. The indigenous side of things mainly consisted of harvesting fruits, nuts, bulbs, leaves, and other items gathered from wild plants as well as the hunting of wild game, though eventually domestic cattle were introduced as well as grain crops like maize. Today, a staple meal remains mieliepapa kind of porridge or polenta made from ground maize. Meat also remains central to the South African diet with braai (barbeque) and biltong (dried & preserved) being the most common methods of preparation. Beef, mutton, goat, and chicken are all found in South African dishes. As far as foreign influences go, the Dutch brought spices like nutmeg and chili peppers as well as pickled fish and a variety of fish stews, the French brought wines and traditional recipes from France, and the Indians brought curry dishes, chutneys, and fried snacks, amongst other items. In addition to this adopted fare, the major cities of the region will have a variety of dining options for all tastes and budgets. There are no major airports in the region surrounding Drakensberg. The nearest international airport is King Shaka International Airport in Durban, located about 2-3 hours to the east on the coast of South Africa. Pietermaritzburg (a little over an hour closer than Durban) has a smaller regional airport with daily domestic flights. By car, the N3 highway is the major throughway connecting Durban in the south to Johannesburg in the north. There is also bus service which runs between Durban and Johannesburg/Pretoria with stops in Pietermaritzburg and at the Ampitheater in the Royal Natal National Park (just to the north of the Drakensberg mountain range). Looking for a hostel in Marrakesh, Cape Town, Nairobi, or Zanzibar?